View our full RL-KLT range online today at utzgroup.co.uk. Standardised accoring to the VDA 4500. | George Utz Ltd. The RL-KLT small load carriers are mainly used in the automotive industry and are standardised according to the VDA standard 4500. The advantage of this load carrier is the suitabilty for automatic handling for example on coveyor systems. Manual handling is also possible thanks to the shell handles on each short side. 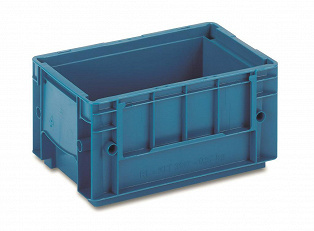 This KLT has the external dimensions 300x200x147 mm.